Deciding how to compensate your sales staff can sometimes feel like a “chicken or the egg” scenario. You need good sales reps to get customers and you need paying customers to expand your hiring budget. So, how do you strike a balance? By developing a scalable sales compensation plan that can evolve with your business. While there’s no single compensation plan that works best for every business, there are some guidelines you can use to create a fair plan that motivates your team to deliver results. A sales compensation plan refers to the combination of salary, commission, and other incentives used to compensate sales reps. You should try to tailor your sales compensation plan to accommodate different types of sales roles and reward the specific behaviors you want to see from each team member. Why Is It Important to Create a Balanced Sales Compensation Plan? Compensation influences employee behavior and expectations. If you want to reach a specific goal or quota, you need to create a sales compensation plan that incentivizes sales activities that align with your business goals. A sales compensation plan should to be based on performance to attract, retain, and incentivize talented sales reps to perform their best. For example, a SaaS startup might offer a small incentive for sales reps to land new customers and offer a larger incentive for upselling current subscribers. The actions that are rewarded most strongly are what your team will focus on achieving. There are a variety of ways to structure a sales commission plan. In many cases, startups use a combination of base pay, sales commission, and additional bonuses to support the company’s objectives. One common thread among all plans is the presence of incentives called accelerators, often in the form of higher payouts for reps who reach or surpass their target quota. This compensation structure allows sales reps to earn more commission as profits increase. The actual amount paid is often based on average profit margins from a given month or invoice period. High-performing sales reps are rewarded to keep working hard and less successful team members are motivated to improve. Another of the major benefit is that the business only pays more when it earns more revenue. 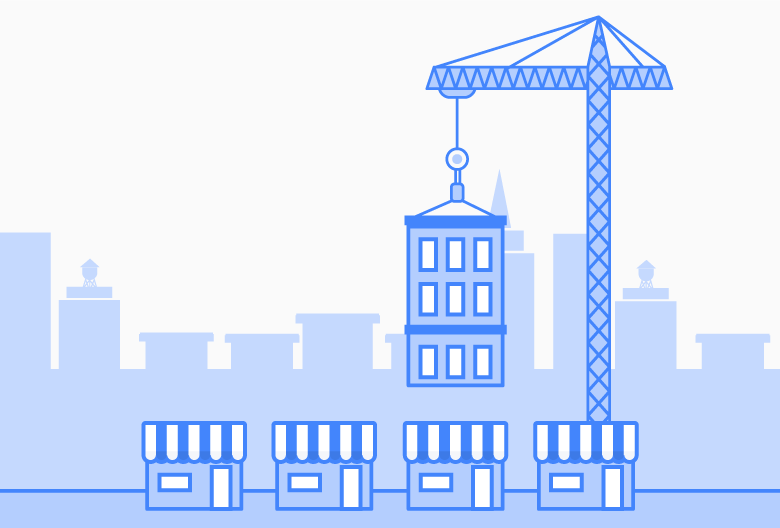 So, this plan scales to reward reps when business is booming. However, you risk damaging morale when margins are low. For a sales team that is highly motivated but suffering through a difficult month or quarter, the reduced compensation can add insult to injury. With a quota-based plan, compensation correlates directly to quota attainment. This type of plan is either based on sales volume or percentage of quota reached over the previous month or quarter. The upside is that keeping track of how much each rep has earned is simple. Since many reps monitor their volume or quota attainment to make sure they’re staying on target, this straightforward commission structure encourages reps to stay motivated. Each rep’s pay is influenced by three different factors: profit margin, revenue, and a third metric that aligns with the company’s goals. The third component might be something as simple as reaching a monthly quota for new customers, upselling, or selling a specific product or package that the company wants to promote. 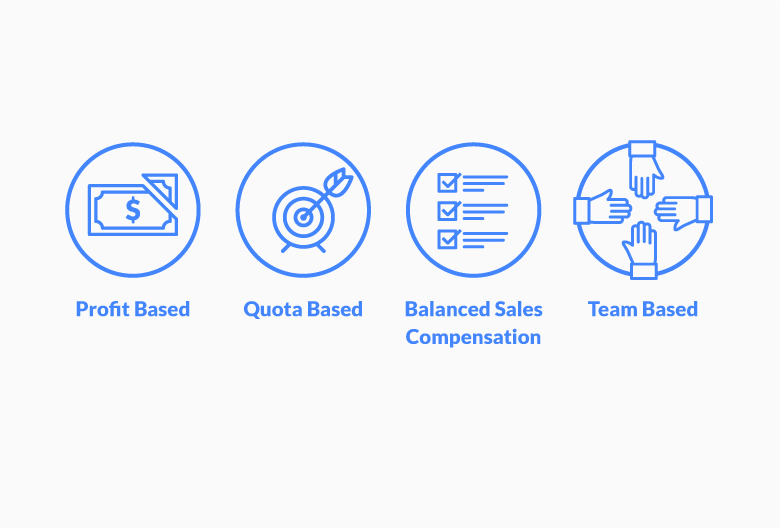 A balanced compensation plan can be custom-tailored to support your business goals while still rewarding high-performing reps for making more sales. Everyone receives a bonus when quarterly goals are reached or exceeded. This structure encourages sales reps to work as a team, motivate each other, and take responsibility for their own contribution. This works best for close-knit teams where everyone contributes to the outcome of each deal. For instance, the sales development rep, inside sales rep, and sales engineer all play an integral role in attracting new business. Since they each have different duties, it makes sense to reward them for functioning as a well-oiled machine, rather than as competitors. On the other hand, a team-based compensation plan can backfire and lead to conflict if someone is not pulling their weight. Businesses that operate on a subscription basis, including most SaaS companies, face additional complexities when it comes to determining fair sales compensation. That’s because once your business is up, running, and serving customers, your sales team needs to focus on retention and upselling – not just landing new customers. When customers sign up for your service, the goal is to keep them as a paying subscriber for as many years as possible. It’s more cost-effective to maintain relationships with existing customers than to acquire new ones, so your sales reps should try to extend the customer lifetime value to maximize revenue. Renewing contracts with current customers. This requires keeping customers happy after the initial purchase. Upselling services to existing customers to bring in more revenue without spending more to acquire new customers. Signing new customers with longer terms. For example, pushing annual contracts instead of monthly contracts to secure ongoing revenue. Signing as many new contracts as possible to increase MRR. You want to increase revenue per lead and retain top performers. Offering a competitive base salary with generous bonuses can help you get there. Consider requiring reps to cover their base salary, plus benefits, before paying out bonuses. This prevents you from paying commission to low performers while also guarantees rewards your most productive reps.
Another thing to consider is paying your reps after the client pays, instead of when they sign a contract. This ensures your sales team continues to offer great service to new customers during onboarding, rather than getting caught up in the next potential sale. 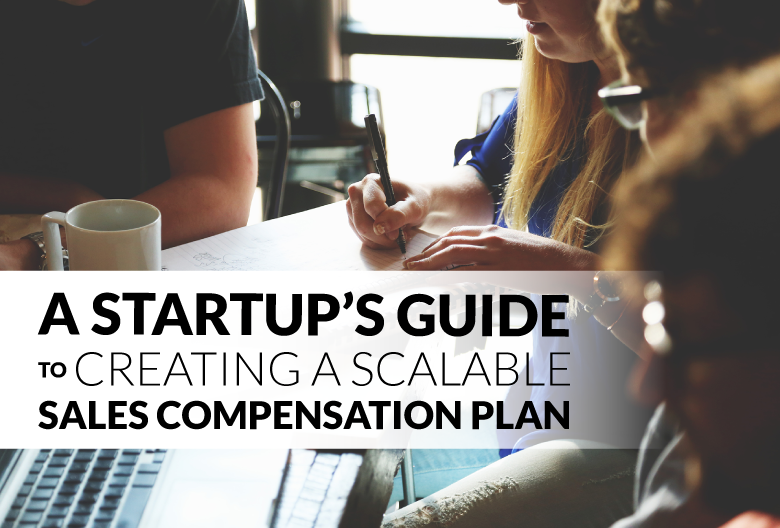 Can Your Sales Compensation Plan Scale with Your Business? As your business grows, your priorities shift. This requires adjustments at every level of your company structure, including how you compensate your sales team. Early stage startups that are still figuring out product-market fit need entrepreneurial sales reps who can help develop the sales process. Since revenue is likely low during this initial period, it’s best to offer a higher base salary until revenue picks up. As your business matures, you’ll start to notice which stages in your sales process need improvement. Maybe you need to reduce churn or land higher-value customers; maybe you want reps to focus on selling a new product you’ve just launched. Whatever changes influence your business goals, make sure your sales compensation plan shifts to match them. Another aspect of successful scaling is being wary of signs of trouble. If you notice employee turnover is on the rise, look at how you can incentivize your reps to stay. If you find that middle of the pack sales reps are making around the same amount as your top performers, readjust your commission structure to make it more competitive. Before you make any strategic decisions, you need to figure out what you want to achieve. When creating a compensation plan, this means writing down and prioritizing your primary business objectives. This will provide you with a solid foundation on which you can develop a commission structure that aligns with your goals. Startups entering new or existing markets should be willing to offer a higher base salary to attract top-performing sales reps. Unlike mature businesses that have a defined market share and established brand, a startup is just beginning to build a customer base. Drawing talented employees into these uncertain situations requires offering a predictable compensation plan. A seasoned sale pro can demand high-value compensation, which might include generous base pay plus commission. You know a veteran sales rep can grow your business, but you have to pay up to benefit from their experience. On the other hand, an inexperienced sales rep eager to prove their value can be motivated by a plan than relies much more heavily on commission. As your business matures, it’s important to periodically review your sales compensation plan. Check in to see if it’s still supporting your business goals and offering value to your team members. If your top performers aren’t being recognized and rewarded for their efforts, it might be time to restructure your compensation plan to make sure they stick around. Maintaining a fair and balanced sales compensation plan ensure your reps know what it takes to be successful and get rewarded fairly for it, which means you can attract top sales reps, assemble a loyal team, and direct your business towards long-term success. A tool like Propeller CRM can also support your business’ growth. Startups that use our platform spend less time crunching numbers and tracking data so they can focus on generating leads and making sales – all from within their Gmail accounts. Why not start your free trial to see for yourself?